It's been said, in times of great deceit truth is revolutionary. Here we are in 2015 and now that martial law "practice" drills or "urban warfare" exercises are begun let's all think for a minute and consider where the lies and deceit surrounding Jade Helm begins. First, it all starts with the names they use in substitution for the scarier more realistic and understood "martial law". They instead use phrases like "urban warfare", "military training exercise". Call it whatever you would, it's the same thing. It's illegal practice for martial law which is when the military forces take on the role of local law enforcement. Then there is the motto they've chosen- "Master the human domain". Really? Is there anyone who thinks this operation is about defending freedom? Helping humanity? Anything good? The motto says it all. The intention is to conquer, to control, to defeat, and overcome human beings. Warning to all! Then there is the supposed meaning of the acronym associated with JADE HELM- Joint Assistant for Development and Execution- Homeland Eradication of Local Militants. Whether this is the true meaning of this acronym or not it only shows how the Jade Helm psyop is already in effect. On top of that, look no further than Wikipedia already shockingly characterizing the real live Jade Helm operation as "Jade Helm Conspiracy Theory". So even as the treasonous participants set off explosions on U.S. soil rocking people's houses, the exercises are STILL a "conspiracy theory". This gets at the underbelly of the Jade Helm psyop. It goes like this- 'We are coming for you, we will set off ordinances and practice killing and rounding you up but if you identify what we are doing, YOU are a "conspiracy theorist" for jumping into any conclusions or thinking you know what we are doing'. Is there still anyone out there that doesn't think "conspiracy theorists" is the most overused word in America? That Wikipedia is already pounding away at the "conspiracy theory" psyop theory is only a clear attempt to hold onto the sheep that are still asleep in hopes of preventing mass awakening. What we are seeing every day now is a real-time effort by the globalist control system at doing everything they can to prevent mass awakening. Unfortunately for the globalists, their brainless CIA, their dying mainstream media and the new world order, humanity is irreversibly catching on to what is happening and the faster they move the faster people are waking up. So let's push the awakening even more by doing whatever little things we can do to accelerate the awakening in light of the Jade Helm 15 operation. As in martial arts, one must always find a way to use the enemy's strength against him. So let's consider 10 ways that we can use the Jade Helm 15 operation against the very globalists and their drive for a new world order. Are you someone that always tries to talk innocent teenagers from joining the military? Find it hard to convince them not to join? Well with Jade Helm 15 already underway in Flint Michigan now you can show them the videos of the outraged local residents. Let them hear the car alarms going off. Explain to them the fear that residents are experiencing at the hands of the oppressive Army traitors who carry on with their mission without questioning the morality of it. Show them the evil that is brewing. Paint the picture of soldiers potentially having to point guns at their own families and friends then ask them if they are mentally ready for this kind of stuff because that is where we are headed. Hopefully you will set off a bell (or a fire) inside their minds. You now have one more item in your arsenal to tear down the false image the young men and women have of the glamorous U.S. military. Jade Helm 15 offers an opportunity to explain and discuss the concept of a "well regulated militia". Most youngsters who enlist in the U.S. military today have no idea of what the original purpose of a well regulated militia is. According to the U.S. Constitution it is the militia's job, NOT the military's job to suppress insurrection. The militia should operate correctly, meaning those in it (abled bodies approximately ages 16-45) should be familiar with how to shoot their proper weapons etc. It is the function of the militia to defend the state and the individual rights of the people FROM big government. The militia was never intended to be controlled or to operate for the purposes of the federal government. All of this is far from the narrative we see today with the illegal use of the U.S. military to fulfill the duty of the national guard and the militia. The incorrectly used and out of place Jade Helm operation is a great opportunity to raise this issue and expose the treason and lawlessness intertwined in it. What better time to reflect on history and the many previous attempts at martial law and tyranny by tyrants and oppressive empires of the past. Now is a great time to show the world around you that it's the same old script playing out over and over again. Government gets too powerful- Government uses its military against the people- Many die and are oppressed- Evil, corruption, oppression and anguish abides. There are no versions of history where martial law and tyranny worked out for acquiring more freedom and liberty. That only happens in the false narrative being told by CIA's mainstream media where Jade Helm is a harmless fun drill and anyone questioning it is a "conspiracy theorist". Remember, in the minds of today's CIA's mainstream media we are free, and everything is just fine. A bit shocking to think about at first, but sadly true. As we have seen in Texas where Governor Greg Abbott took steps to announce that the state National Guard will be watching the U.S. military, the event at least serves as a reminder of state sovereignty rules and the state's have the ability to shut down Jade Helm. We saw earlier where the state of Colorado exercised its right to tell Jade Helm to get lost. This could be one of the big lessons/reminders of Jade Helm 15. Let's remember that Jade Helm is taking place only in the states that have ALLOWED it to happen in. Keep that in mind, challenge your state politicians and lets use this against those politicians who have said yes to Jade Helm. This is one more thing to hold the politicians accountable for. As stated above, Jade Helm is a great opportunity to make others aware that the state, not the federal government, has the ultimate power over what happens. Most people especially in the U.S. military have no idea how this works. Unfortunately too many Americans are clueless to the power structure and chain of command. Most Americans believe what they see on TV and Hollywood regularly portrays the federal government as the ultimate authority. This is entirely unconstitutional and none of this illusion is based on reality. Just remember how in 2014 the state of Nevada and its sheriffs told the Bureau of Land Management (BLM) to get lost. Jade Helm is picking up where Bundy Ranch stand-off left off only it's the military this time trying to push their weight around multiple states in joint martial law operations. Let's use Jade Helm as a final and unequivocal reminder that the state (and its national guard) has legal power over the federal government. The new world order had been spoken about by many presidents of the past. Many critical thinking Americans have long ago reconciled the reality of the new world order. To many of us who are awakened to the globalist stated plans the events of our times are not very surprising and they all fit in with how we understand the world. 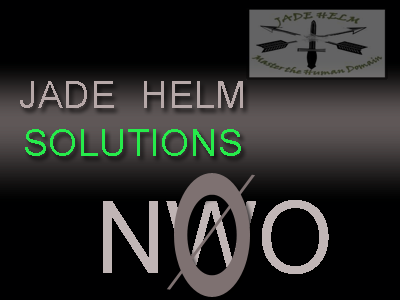 I don't know anyone aware of the new world order plans who is shocked by Jade Helm. The challenge is to use this event as a way of reconfirming to others that the new world order plans are well underway. Just step back for a second and think to yourself, why are we even talking about martial law? What happened to America that someone decided that we, the citizens deserve urban martial law drills practiced in our own backyards? Ask those that you know who may still not be awake to think on their own for once, remind them that the destruction and shutting down of America is central to the new world order plans. This is the destruction we are all now seeing. 7- Opportunity to vindicate "conspiracy theorists"
Everyone who has been accused of being a "conspiracy theorist" can now sit back and do the "I told you so". Of course those whose cognitive dissonance is on high will still ignore the warnings but don't worry too much about those people, just go for those that still have some traces of common sense. Don't try too hard, let them see for themselves the drills, the explosions, the fear, the guns, the tanks, the firepower and the military forcefulness being practiced. It all speaks for itself. Now is the time to vindicate "conspiracy theorists" who were warning of this stuff long ago when no one would listen. Remember truth is realized. You don't have to go over the top and burn yourself out to prove this stuff to others. It's all unfolding on its own now. This goes hand in hand with #1 above. Along with using Jade Helm to prevent people from joining, this event can also be used to wake people up who are already inside the U.S. military. Let's remind the active duty soldiers in the line of fire that they are being used as tools for the globalist. Remind them of the Pat Tillman story and remind them that like SEAL Team 6, they too could potentially be disposed of by "friendly fire" if they don't comply with ongoing unlawful orders. Help spread the word within the military. Appeal to the consciousness of other active duty soldiers. Remind them that its not just their lives at risk, but also their integrity, their morality, their humanity and their consciousness at risk. Remind them that life is for keeps and that bringing the Middle East occupation violence home is an act of treason, stupidity, ignorance and lack of morality. Also remind them that we the people are truly on their side and we hope that when they are given unlawful orders they will do the right thing. Remind them that their are more of them (troops) than there are corrupt commanders. Finally remind them that if a commander gives them an unlawful order it is their duty and obligation to disobey those orders. That act of disobeying an unlawful order is what America is really all about and it represents the spirit of truth, liberty, morality, freedom and the American way that our forefathers were willing to die for. In other words Jade Helm can be a powerful tool to bring this message across to active duty soldiers. Know active duty soldiers who don't want to listen? Are they still defending the act of obeying unlawful orders? Hit them with some history and remind them that during the Nuremberg trials Nazis who relied on the excuse that they were just following orders were sentenced to death. Now is the time to remind active duty Jade Helm participants that there is a historical record for execution of those who commit crimes against their own as well as crimes against people of other nations. Remind active duty that those who ignore the lessons of history are bound to repeat them. Finally, as we see martial law urban drills become the norm in America this year, and as we inch closer and closer to a real live martial law takeover of America, let's remember that things are coming to pass as was predicted by many of us truth seekers. Many of us had been predicting that things will first get much worse before they get better. It is clear that Jade Helm 15 represents a time in America when things will and are now getting much darker. Essentially, this is the darkness we've been waiting for. Things will factually get much worse, then as a result of that oppression and anguish I believe humanity will rise as it has throughout history. As we are seeing with Jade Helm, thanks to CIA's mainstream media once again we have a segment of profoundly deceived Americans who are being brainwashed into thinking martial law urban drills or "military exercises" is normal, okay, harmless and uneventful. They are being trained to simply believe whatever CNN and the rest of the mainstream media says the event is. This active engineered ignorance is the source of our future suffering. Yes, it is true. What the blind sheep don't know, really is killing people. Ignorance is now being used as a weapon of mass destruction. And so it is clear to see that our fight is more directly against mass ignorance which in turn is engineered by the control system. It is therefore the followers of orders that we should fear the most. They are the ones right now who are cooperating with Jade Helm 15. They loom in the background of our lives blowing things up in distant exercises and they are lurking inside the U.S. military preparing to participate in Jade Helm drills as we speak. Our primary battle thus is the battle for their minds. Let's keep that in mind moving forward. It's always good to know who your primary target is in a battlefield. For those of us awake it's the ignorant sheep. So, can we handle Jade Helm 15 in a skillful way to use the very operation against them. It may sound like a tall order but you might be surprised to realize how easy this prospective idea is. Truth is, as I've said after all, something you realize. Love is something you feel. Consciousness is something you experience. Morality is something you understand. And care for others is something you choose to practice after you put together all the information you have and develop an understanding of it. Let's show the world and the U.S. military what their occupied minds cannot currently see. There comes the time to show with action. This is where we all need to be today. Let's show the U.S. military that Jade Helm is wrong and its a precursor to something even more nefarious. Let's show them that Jade Helm is also a choice between love and fear, what is right versus what is wrong, building up versus tearing down, healing versus killing, and being a true patriot versus being a criminal who follows orders. With Jade Helm in progress let's use it to show everyone the choices they have and then let them decide on their own what choices they will make.